It all starts with choosing the perfect wedding venue for your seasonal wedding. The creekside ceremony site at SkyPark Weddings is beautiful anytime of year but is truly exquisite during Autumn. The mountains surrounding the venue are the most beautiful during this time, especially when the trees start to change their hue and the fog rolls in over the hills. The venue acts as a natural Fall backdrop and really sets the mood for your special day. Another reason a Fall wedding is ideal is the arrangement of flowers that arrive with the season. 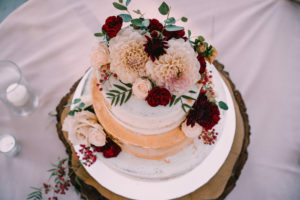 Some color palettes to consider when choosing a Fall wedding bouquet are a spectrum of reds and maroons, paired with some green foliage that add earthy touches to your wedding. 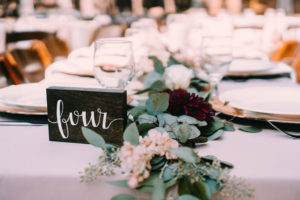 Whether you choose to go casual, bohemian, rustic, or lush with your flowers, Fall will provide you with the floral arrangement of your dreams. Much like Fall flowers, this season calls for a lot of creativity with tablescapes and centerpieces. 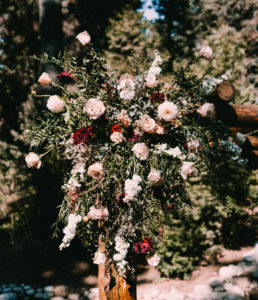 Try incorporating some maroon and light colored flowers, as pictured above. Fall foliage can be a nice addition or replacement to table runners at your reception tables. 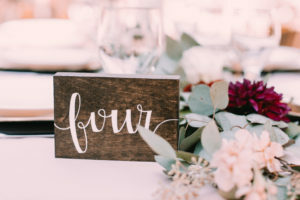 Another great detail is a rustic style table number written in calligraphy. 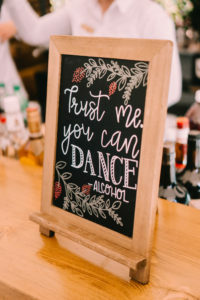 Try upgrading to our bar packages for a variety of drinks to keep your guests warm during the party. Some Fall favorites include apple cider and hot toddies! You might even want to consider a hot chocolate serving station. Another reason to love Fall weddings so much is the color palettes throughout different aspects of the wedding. 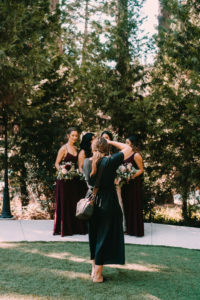 We really just love how maroon bouquets compliment these gorgeous maroon bridesmaid dresses. This color combination is perfect for an outdoor forest venue like ours with plenty of greenery as a backdrop. 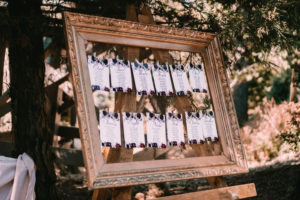 You can get really creative and fun when planning wedding favors for your guests. Some couples choose to give out mini pumpkins as wedding favors, some mirror the hues of Autumn and give out scented candles and soaps. 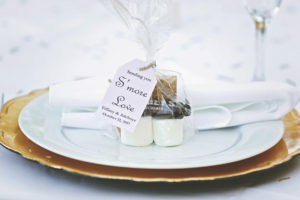 Our personal favorite is this s’mores kit a couple gave out at a wedding here at SkyPark. This wedding favor was a perfect treat for a Fall day and an absolutely adorable way to send off guests! 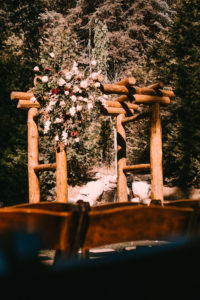 SkyPark Weddings is a gorgeous, forested wedding venue located in the San Bernardino National Forest. Surrounded by majestic mountains, the fairy tale wedding of your imagination will no longer remain in your head or on your Pinterest board. Our state of the art amenities and friendly staff are hard to come by anywhere else. Enjoy the ambiance of the forest and celebrate your wonderful occasion underneath the full blanket of stars visible from this mountain peak. To visit our unique property, please contact us by emailing info@skyparkweddings.com or call 909-744-9924.